Pierre Langlade was a designer at Henry Widnell & Company’s Carpet Factory in Bonnyrigg during the latter part of the 19th Century. He was also an artist. 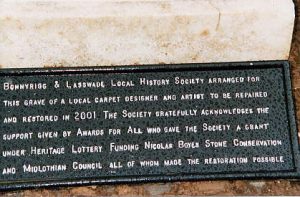 Bonnyrigg and Lasswade Local History Society received support from Midlothian Council and practical assistance from Nicolas Boyes Stone Conservation, who have recently undertaken the repair of Pierre Langlade’s grave. The repair was made possible through the generosity of Awards for All who awarded the Society a grant of £989 from the Heritage Lottery Fund. Pierre Langlade was born on 28th May 1812 at Aubusson in France, a small town famous for its carpet design and manufacture. It was only natural therefore that a native of the town with the artistic skills that Pierre enjoyed, should see in carpet manufacture an arena for the display of his superb talent. At the age of 17, in 1830, shortly after the Revolution, Pierre trained in Paris but returned to his native town of Aubusson, where he specialised in artistic designs and flower painting. However the draw of Paris was too great and he returned there in 1843 to set up his own publishing and printing business and in 1855 married a Parisian. Once more Pierre returned to Aubusson this time accompanied by his wife where he resumed his relations with his old firm, which was subsequently converted into an Anglo-French company. This step brought an influx of skilled operatives from Bonnyrigg, Midlothian, to Aubusson and Pierre’s show of kindness to them soon formed a bond which he never neglected. It was because of his loyalty to the Scottish people, and in particular one operator, at a time of bereavement, that Pierre insisted a Protestant minister be brought from Paris, to conduct the funeral service. Whilst endearing himself to the Scottish people, he was regarded in disfavour by the then Roman Catholic community and had to suffer considerable hardships as a consequence. Therefore, an offer from Henry Widnell & Company, a Midlothian Carpet maker, induced him to come to Bonnyrigg in 1864 and for more than thirty years he remained faithfully attached to the business of carpet designing whilst refusing tempting offers from other quarters. During the last fifteen years of his life, freed from the responsibilities of a routine day’s work, Pierre Langlade continued to paint and he completed many charming studies in oil and water-colour, particularly of flower subjects. Pierre spent the evening of his life in quiet repose and had many visitors to whom he delighted to recount his childhood recollections of the stirring times in France and to talk about the art he loved so dearly. His work was frequently seen in the Royal Scottish Academy and at other exhibitions and the last known watercolour that he executed was in his 98th year, just months before he died, on 2nd November 1909. 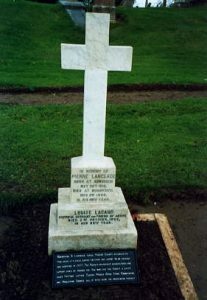 Pierre Langlade is buried in Cockpen Churchyard, as is his friend and housekeeper Louise Lacaud. Over the decades Pierre’s grave fell into a state of disrepair. 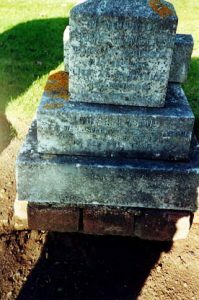 In the autumn of the year 2000, Bonnyrigg and Lasswade Local History Society felt that this grave should be repaired and the necessary work was carried out in September 2001. The Society would like to acknowledge the support, which they received from Midlothian Council who arranged for the base and plinth of the headstone to be made secure in the early part of 2001. The Society then sought funding to carry out a general repair to the headstone. This included fixing the cross to the headstone, removing biological growth, consolidating the lead filled inscriptions as well as securing the headstone to the plinth. Funding was also sought to cover the cleaning of the stone and to supply a cast iron presentation panel. As already mentioned, Awards for All awarded the Society a grant to enable this work to proceed and the Society is extremely grateful to the Funders for their very positive response to our Application. The actual repair work was carried out by Nic Boyes Stone Conservation to whom the Society expresses their deep appreciation for the expert craftsmanship involved. The Society is also grateful to Mrs Celia Pattle for supplying the historical notes about Pierre Langlade for this article.